Keeping your booth current is important. It represents who your company is and what it does. In this rapidly changing world, company branding and market focuses change quickly as do customer sentiment – and keeping up with these issues requires frequent changes to your booth to make it current. An analogy is a dated website: without the latest bells and whistles or updated branding, your company may be perceived as needing a refresh. Not quite the impression you want to make with prospects. In this blog, we’d like to focus on the drastic change in the fundamentals of exhibit design that incorporate the newest technologies that are available to exhibitors to use within their exhibits—which are changing the way exhibits work, how attendees interact with information, and increasing visitor engagement. These new technologies represent just some of the hottest, unique and compelling ways to attract prospects to your booth, keep them engaged—and keep them talking about their experience at your booth long after they have moved on. The tradeshow attendee is no longer a spectator, but a participant in creating an emotional experience that results in impactful, long-lasting impressions. Remember, engagement with customers is won or lost in the first few seconds. Attendees want new information to hold their attention, so build an innovative presence that provides that information in a way that is new and exciting. AND present it in a way attendees will remember. Although not exhaustive, this list represents some of these hottest technology options that may make sense for your next ‘updated’ display. Want to go from zero to spectacular? Then maybe augmented reality (AR) is for you. Seriously, it can help you present a savvy demo rather than a boring rehash of what’s been done. Tradeshow booths have come a long way, and today, if you can dream it, you can make it so – with augmented reality, where exhibitors can use technology to take information about the real world and enhance it with an interactive and digitally rich experience. If showing how your products work is challenging, perhaps AR would be worth looking into. AR can provide booth visitors with an interesting detailed view of products whereas static displays might be the end of the path. Flat screen monitors and LED screens are replacing static means of presenting graphics, including banner stands and vinyl signs. iPads and tablets have become endless opportunities for educational lounges, customized digital guides, or tethered to display stands – in ways that make a statement. No longer do you need- or want- hard copy portfolios and catalogs that are costly to print and ship. Exhibitors can also use flat screen monitors as touchscreen interfaces, gaming stations, lead-capture kiosks, and more, all of which can help facilitate interaction and a more memorable experience. The key is to bring them in, and keep them learning about your products and services – in a way that enhances their experience. There is a shift from static graphics to dynamic graphics, which is changing how the booth structure supports your company story. Using flats screen monitors and video, LEDs, and 3-D technology all contribute to more unique and engaging experience. It’s all about making a personalized and unique experience. Some companies are going to great lengths for a “bigger is better” multi-user video walls to capture attention and build brand loyalty. Interactive video walls is a strategy that involves creating an interactive touchscreen application, showcasing your product and company branding via an interactive interface. This is a proven method to increase the interactive experience – that goes a long way toward educating and building brand-followers. These walls have the capacity to enable the “wow factor” and capture the attention of multiple users while offering a unique and personalized experience. Gone are the days when lighting was purely a utility. Now, lighting is used as an art form to enhance the attendee experience and create personality and drama – from dimly lit seductive lighting to dramatic lighting highlighting products or presentation areas to attract and cajole attendees into further exploring all your booth has to offer. In today’s new custom exhibits, lighting is being leveraged as a very powerful design element because of the influence it can have on the attendee experience. A good exhibit designer can use lighting to bring out emotion, guide attendee focus, and establish a hierarchy of importance within spaces. 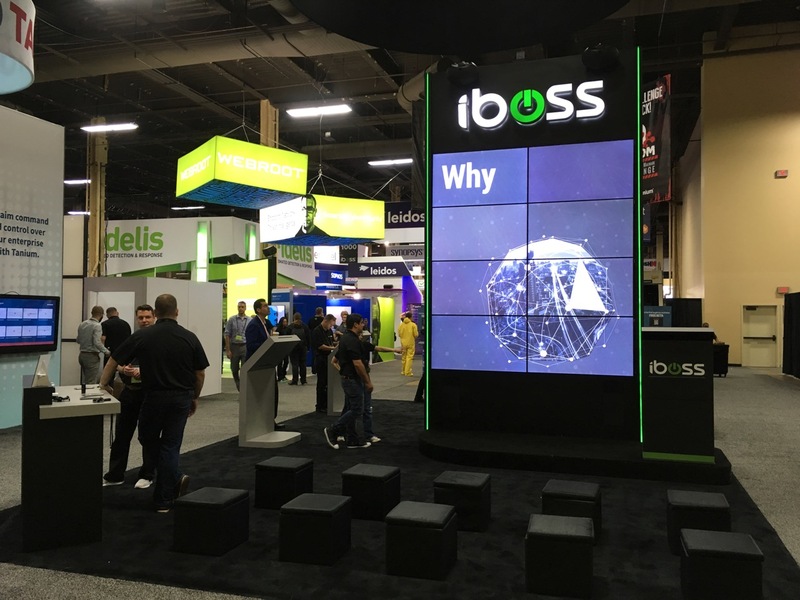 Understanding how to make your booth more ‘effective’ with current technologies is an important aspect to consider and collaborate on with your exhibit designer. Once you are ready to do an update on your company booth, technology design elements can be implemented based on your goals, and objectives. At ExhibiTeam we work with clients to design a booth that includes all the necessary design and technology components to ensure your booth is current, stands out in the crowd, and most important – is built to connect with your future customers. The sky is the limit in terms of what can be done, and today’s pace of technological innovation only presents endless opportunities. Interested in knowing how we do this? Contact us today to see how we can help you with your needs.